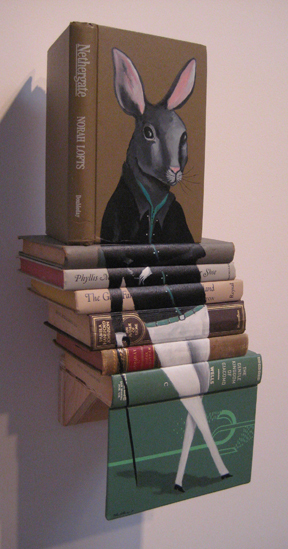 While strolling through the galleries on the recent Culver City Art Walk, I saw some ingenious work that bridged the worlds of books and art -- material somewhat apropos to the theme of this blog. Los Angeles artist Mike Stillkey, paints on books instead of canvas. 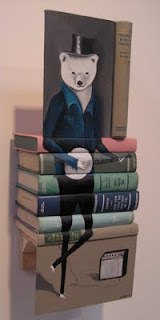 He pushes the three-dimensional component of books, making some of his pieces sculptural. It's exciting to see this kind of genre-bending art, particularly when the technique and execution are so polished. Conceptually, Stillkey's work is inventive, imaginative and whimsical. His work is shown at LeBasse Projects. 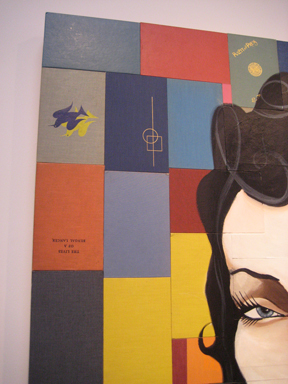 Have you seen any captivating books on art, or art on books lately? Also on the topic of art, see my latest review in WhiteHot Magazine of Contemporary Art, on an exhibit of new paintings by Los Angeles artist, HK Zamani, at CB1 Gallery. Coming soon -- creating a playlist for your WIP, summer reading lists and more. I wish I could design my own book covers. These are really magnificent pieces! Books and art. They certainly go together. thanks for the post. I love the look of this work. Miss the LA FAN group but am so busy with the gallery. Ten Women is taking up a lot of my time but least Culver City is not too far from AK. Interesting. Yet another purpose for the marvelous book! Holy cow, that's amazing! I haven't seen that type of art before, but I love it. Imagine that on a bookshelf. Wow.